The most frequent comments on my makeup pictures/videos on Instagram tend to be about my skin. Glowy skin is '100% my type on paper' and I'm rarely seen without my signature highlight. I definitely look after my skin very well and I wanted to share some of my top skincare and makeup tips to get that coveted glowy skin. I've covered it briefly in my two recent Instagram videos, however I wanted to go into a little more detail here. 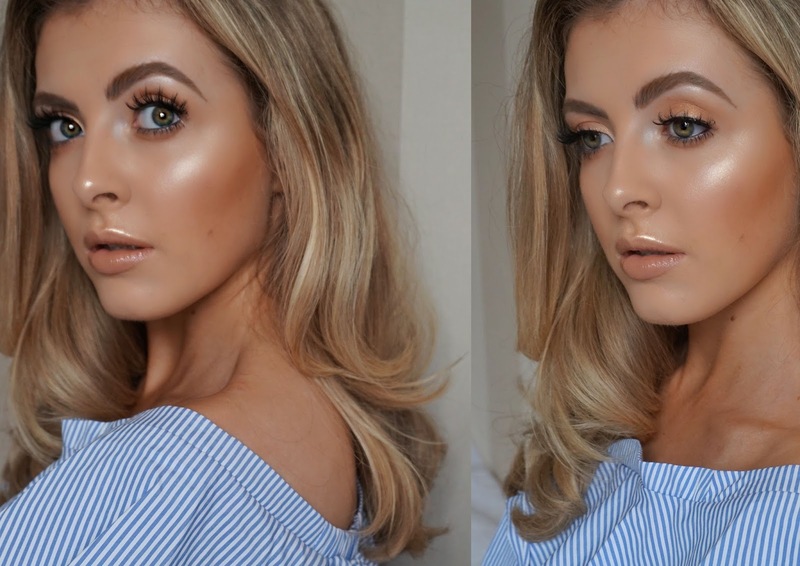 If you want an intense glow like in these images follow all the tips, but if you want a subtle glow instead, you can select softer highlighters or just follow the skincare tips! Ever since I started using exfoliating toners, my skin texture has improved massively, especially around my nose. I'm thinking about doing a post all about exfoliating toners very soon now that I've tried a few different ones so I won't say too much today! However, currently in the mornings I am using the Erno Laszlo White Marble Essence Lotion. This isn't really an acid toner, but I do use it before serum/moisturiser so I thought I'd include it here. Essentially, it evens out skin tone, rehydrates and adds luminosity to the skin with amazing ingredients like Glycerin (basically a moisture magnet!) and Daisy Extract. For nighttime, I'm currently using the First Aid Beauty Facial Radiance Pads but I change this up all the time so I'll share my other faves in a future post! It's really important to select serums and moisturisers that are best for your skin type. My skin is generally normal to oily, so I stay away from anything too rich. I've been loving the Vichy Mineral 89 serum in the AM and PM (full review here), and I follow it up with another serum in the evening for extra hydration. In the morning, however, I just stick with the Mineral 89 and add my all time favourite AM moisturiser - the Origins GinZing. I have been on this product ever since it launched and honestly, I've lost count of the number of pots I've gone through! I find it's the absolute perfect base for makeup too as the gel formula sinks in really quickly and feels nice and light on the skin. Getting a glowy makeup application means starting with the right primer. My dream combination which gives me glowy skin AND incredible staying power is the Illamasqua Hydraveil and the Becca Backlight Priming Filter. I've done more in-depth reviews of both of these which I've linked on the product names. If these are a little too pricey for you, I've done a Top 3 Glowy Primers post which features cheaper alternatives - however they don't quite give you the lasting power that this combo gives. Picking a dewy foundation is obviously essential for glowy skin. However, it definitely doesn't have to be light coverage if you don't want! My holy grail is the NARS Sheer Glow which is a medium coverage, satin finish foundation, and then I can amp up the glow with highlighters later on. Plus, if I have used my illuminating primers, the glow still shows through the foundation, so this is a great option if you have oilier skin and don't want the feel of a really dewy foundation. I even use my Maybelline Fit Me Matte & Poreless foundation sometimes and just adds plenty of highlighter creams/powders to get the glowy look - this way you choose where you want to be glowing too so again, great for oilier skin. My other makeup tips for glowy skin would be to use powder sparingly (if you can!). I tend to focus on the undereyes and my T-zone, leaving the rest powder-free. I'd also recommend using creams/liquids - I am obsessed with the Elizabeth Arden Gelato Gel Blush in Coral Daze at the moment as it's a liquid blush that gives a beautiful tint along with a soft glow. For liquid highlight, the Cover FX drops are ideal for an intense glow (it's what I used in the above photos), but for a softer look, try MAC Cream Colour Base in Hush or Benefit High Beam. I always top my liquid highlight with a powder, so select your fave highlighter - for me it's Becca Champagne Pop without a doubt. Honourable mentions also go to The Balm's Mary Lou-manizer and Laura Gellar Gilded Honey. With application, I personally go all-out and do the tops of my cheekbones, nose, cupids bow, brow bone, inner corner of my eye and sometimes just above the brow very lightly for an extra sheen. It's really up to you though - I know some people hate the nose highlight so just leave that out if you don't like it. Finally, if you want to go full-on glow, top the look off with a beautiful glossy lip. I used NYX Fortune Cookie here which is so so good (and cheap!) but I also love the Anastasia Beverly Hills, NARS and Colourpop glosses. Remember, if you're going out with beautiful glowy, glossy skin, don't forget your body! If you're wearing something that shows off your shoulders or collarbone, sweep some powder highlight over them just to add that extra shine. Let me know if you have any tips for glowy skin in the comments. Hopefully this post has been helpful to some of you!